He rolled his pupils, adjusted his shiny grey collar, unbuttoned his tuxedo, flashed his shiny-teeth grin and whispered through the famous fish-lipped pout: “I don’t kiss and tell.” This, when asked about his numerous flings. 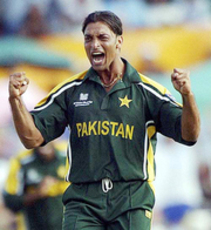 As the audience cackled, Shoaib Akhtar winked Bollywoodesquely and folded his pudgy palms in a clasp. And then, without the metaphorical kisses, he told like he never told before. On the day his tell-all autobiography, aptly titled Controversially Yours, hit bookstands at Rs 499, Akhtar came unplugged at a city hotel in true Akhtar style, reverting to his famous ‘I runs fasts, I bowls fasts’ days to advertise his wares.